When I think of Virginia, I think of the early eastern settlements, especially sophisticated Williamsburg. I was still thinking that way when I headed to Roanoke, little realizing that, for many years, it was on the Virginia equivalent of the western frontier. It&apos;s come a long way, baby! Today, with a population of 100,000, Roanoke is Virginia&apos;s largest city west of Richmond. Once the headquarters of the Norfolk and Western Railway, Roanoke is still an important railroad town and this part of its heritage is amply celebrated. The Norfolk and Western passenger depot was built in 1905 and was redesigned in 1949 by Raymond Loewy, America&apos;s premier industrial designer. Now the building houses the Roanoke Convention and Visitors&apos; Bureau, the Loewy Gallery and the O. Winston Link Museum. Exhibits in the Loewy Gallery highlight his work in the transportation field. He not only styled the station, he designed locomotives, automobiles and even worked on Air Force One and SkyLab - to say nothing of his most familiar design, the Coke bottle. Another "must" is the Virginia Museum of Transportation in the historic N & W freight station. The collection comprises thousands of items and over four dozen pieces of rolling stock including the largest collection of diesel locomotives in the South. Whether you&apos;re a rail fan or not, you&apos;ll love the historic Hotel Roanoke. Built by the railroad in 1882, it started out as a Queen Anne structure with fewer than three dozen rooms. Although some original parts remain, it&apos;s grown into a Quasi-Tudor complex with 331 guest rooms, Florentine marble floors, Czech crystal chandeliers and a spot on the National Register of Historic Places. An elevated walkway takes you from the hotel, over the tracks and into historic downtown Roanoke. A short stroll and you&apos;re in the middle of one of the most unusual markets in America. Going since 1882, the first market building was constructed in 1886 but burned and was replaced in 1922. Inside is a food court with interesting local and ethnic specialties. Lining the street in front of the market are stalls open 363 days a year. Striped awnings stretch from the buildings over the sidewalks and stalls. The last thing I expected to find in Virginia was a tiny eatery called the Texas Tavern. This place has been in business since 1930 - and not much has changed. Ambiance? Forget it. Style? Not so you&apos;d notice. There are the usual funny signs, such as "We seat 10,000 - 10 at a time," and some unintentionally funny ones like the ads for Affordable Septic and Portable Toilet Service and Fresh Cuts Lawncare which flank the wall-mounted menu. So why do people line up on the sidewalk to get into this 10-stool dive? Great hot dogs, super burgers and chili - though I must say those Virginians are pretty wussy when it comes to chile in the chili. I loved this place. Additions planned for downtown in 2013 are a new history museum, a hands-on science museum, a theater and a museum of African-American culture. They&apos;ll be in good company with the architecturally stunning Taubman Museum of Art. In addition to hosting interesting temporary exhibitions ranging from the wacky and whimsical Wayne White to fabulous Faberge creations, the museum has a respectable permanent collection of works, including several by Thomas Eakins, whose family lived in Roanoke. And there&apos;s a whole room of jewel-like Judith Leiber purses. Perhaps the town&apos;s biggest draw is its proximity to the Blue Ridge Parkway, a 469-mile scenic drive stretching from the Great Smoky Mountains to Shenandoah National Park. On just the 60-mile section we explored, there was much more to do than we had time to spend. Virginia&apos;s Explore Park Visitor Center (at mile 115.1) sits on 1,100 acres with fishing, canoeing, kayaking, hiking, mountain biking and endurance trails. Or you can experience the terrain frontier-style with Spiritriders Covered Wagon Rides. Mabry Mill (mile 176.1) was a working grist mill from 1910 to 1935, and now it&apos;s a Kodak moment. In addition to the restored mill, there are also exhibits on Appalachian life. The Blue Ridge Parkway is best enjoyed in short drives. It&apos;s lovely any time of year but particularly stunning in fall. Since the drive is the destination, prepare to go slow and savor the scenery. Tulsa has its Golden Driller; Roanoke has its Star. At 88.5 feet tall, the Star, sitting atop Mill Mountain, can be seen for 60 miles. The plaza around it is the perfect spot for a view of the city and the Star draws visitors like light draws moths. Erected 63 years ago by local merchants as a Christmas decoration, it was just too big to store - so they left it up. 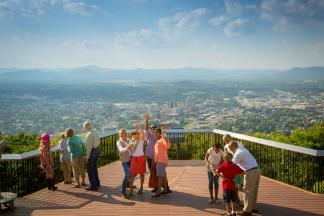 It&apos;s been said that it "stands as a symbol of the friendliness, industrial and civic progress of Roanoke." I think it just means the city earned a star for being a stellar destination. For more information, go to visitroanokeva.com.